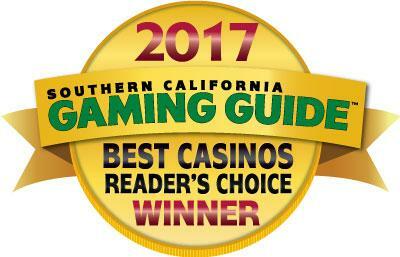 As one of the top casinos in the country, it's no wonder San Manuel has been honored so often. Our focus on providing a World Class gaming experience, top notch service, incredible culinary offerings and unforgettable entertainment results in more than just a great experience for our guests, but also major awards. San Manuel has set two Guinness World Records and has been honored by many major publications, including The Southern California Gaming Guide, Southern California News Group, Press Enterprise, Orange County Register...and many more. And our preferred hotel partner - Bear Springs Hotel, located blocks from San Manuel Casino at the San Manuel Village, was named best hotel! CCYP.com, the Chinese Consumer Yellow Pages, provides consumers and businesses in Los Angeles with the latest and most comprehensive business information and consumer services in life, food, clothing and housing in California and hosts the annual "Asian American Expo" where San Manuel Casino was named the 2019 Top Casino Choice of the Year, an award honoring business and industry leaders who exemplify the pinnacle of excellence standards. The best people, places and things to do are located right here in the IE. Find out who's BEST as voted by the readers of the Southern California News Group. On September 2, 2013, San Manuel Indian Bingo & Casino set the Guiness World Record for Largest Hula Dance with over 1,400 dancers as part of Aloha Bingo. The record was shortlived, however, as on Oct. 3, 2015, as Miyakojima City organized a hula dance of 1,509 dancers at Irabu Ohashi Bridge, in Miyakojima, Okinawa, Japan. The largest air drum ensemble of 2,297 participants organized by San Manuel Indian Bingo & Casino at San Manuel Indian Bingo & Casino in Highland, California, USA, on October 12, 2012. The largest air guitar ensemble of 2,377 participants was organized by San Manuel Indian Bingo & Casino (USA) at San Manuel Indian Bingo & Casino in Highland, California, USA, on September 22, 2011. On July 7, 2006, San Manuel Indian Bingo & Casino set the Guiness World Record for Largest Game of Bingo with 53,991 players at Dodger Stadium in Los Angeles, smashing the previous record of 15,756. The record was shortlived, however, as on Dec. 2, 2006, 70,080 participants played bingo in an event organized by Almacenes Exito S.A. in Bogotá, Colombia.